As the year is approaching its end, it’s only logical for us look back at the last 12 months and make a mental check of our accomplishments. Remember the resolutions you might have set at the beginning of 2013? Yeah, those were great… Oh, you didn’t set any? Well, you’re not alone: I didn’t set them either. In fact, I’ve avoided setting New Year’s resolutions for many years, all after a rather unfortunate experience back when I was a teenager. When I was around 13, my biggest obsession was to grow tall. (Most kids of that age have something to obsess over; usually it’s about some aspect of their appearance, as sad as it may sound. Mine was my height.) New Year was approaching, so I decided to write down everything I wanted to happen to me in the upcoming 12 months. Getting tall, like 6 feet tall, was one of the first things I wrote down. Other things may have included for my family to get Russian citizenship (we recently had moved to Russia from Uzbekistan, and the immigration process was pretty tough, making it hard for my parents to find jobs); for me to make more friends (which wasn’t easy for an introverted new girl in a completely different school). I folded my little letter, sealed the envelope and put it in a secret place to open on December 31st of the upcoming year. The year passed, and the New Year’s Eve came around – time to open the envelope and see what had come true! As I looked at my list, I couldn’t believe my eyes: not a single thing I had written down came to materialize in the course of that year! I was still just over 5 feet tall, my family still waited on our citizenship, and there were hardly any new friends in my life. On New Year’s Eve of that year, just before my family was supposed to gather around a celebration table, I was so bummed out over that letter that I didn’t want another day to come. Ever since then, I’ve avoided making any New Year’s resolutions. Looking back at that experience, I can see exactly what went wrong, and how I basically set myself for a failure with that letter: I had hardly any control over making those goals (dreams?) come true. I couldn’t make myself grow another foot in a year. I couldn’t speed up my family’s citizenship process. I could have made more friends, it’s true, but I wasn’t actively trying – it was more of ‘I wish this happened to me’ type of dream. Thankfully, becoming an adult comes with perks like becoming wiser. This might be the year when I put aside all of my fears and finally set some goals! This is why I decided to put together a few tips on how we all can set better goals for the upcoming year, and how we can reach those goals in the next 12 months. For the record, I’m absolutely content with my height now (5’5″)! No offense to taller people, but I can’t imagine what my life would have been like if I indeed had grown six feet tall. Set goals that you are passionate about. If a goal you picked hardly makes you enthusiastic, you’ll be unlikely to go after it full force. Who needs boring goals, after all? Choose goals that you can actively achieve. That was my biggest mistake in the story above: I wished for things that I had no influence on, no matter how hard I wanted them. I’m not going to set a goal of achieving world peace in the upcoming year because our world’s life has way more participants than just me. Make your goals more specific. Vague goals are no good: practice shows that if we know exactly what we are after, we’ll be more likely to keep going. Instead of putting ‘Lose weight’ on your list, put ‘Lose 20 pounds’. Instead of ‘Eat right’, go more specific with ‘Eat vegetables with every dinner’. Have a strategy on how to achieve your goals. Strategy might be my favorite word of late! It makes a lot of sense: plan out the way to achieve a goal, step by step, and you’re already halfway there! Advance planning is a great way to avoid being intimidated by whatever goals you set. For example, if your goal is to cook at home more often, you can plan your menu in advance for the week and buy all of the groceries for every meal. This way, you’ll have everything you need when you come home at night. Planning will save you time, money, and help achieve your goal! Write your goals down and keep them visible. Put the list on your fridge, bathroom mirror, etc. Better yet, tell everyone you know about your plans! It’s harder to back out of our commitments when others know about them, plus an easily accessible list can help us keep our goals in check. Get out of your comfort zone. This can be a year each of us could achieve something we’ve never dreamed about! Easy goals are boring, so why not try to do something awesome? Just imagine how accomplished you’ll feel after reaching a challenging goal! Never ran before in your life? If you start running in January and stick with it, you could train to run a marathon in fall. Yes, you, no excuses! That is, if you really want it. Dream a little! Yep, that marathon could seem waaay out of your reach, but it’s attainable as long as you plan out your strategy. Don’t strive for perfection because it can take the wind out of your sails. ‘Progress, not perfection’ – I like this phrase often repeated by Lindsay Nixon form Happy Herbivore blog. One step in the right direction means much more than no steps at all. This also means: if you didn’t reach all of the goals you set for yourself in a year, don’t punish yourself. It matters that you tried, and you can keep trying as the time goes on. To conclude this post, I’ve got to mention probably the most important thing: ask yourself if the goals you’ve set can make you a better person. Scratch off any goals or resolutions that don’t aim at that – you don’t need them. It might sound vague, but becoming a better person can be a fine goal in itself, whatever it may entail. Even if you choose not to set any goals in the upcoming year, keep that one in mind. Hope everyone has a wonderful holiday season! I’ll resume my posts as soon as I get back home from visiting my husband’s family in New York. 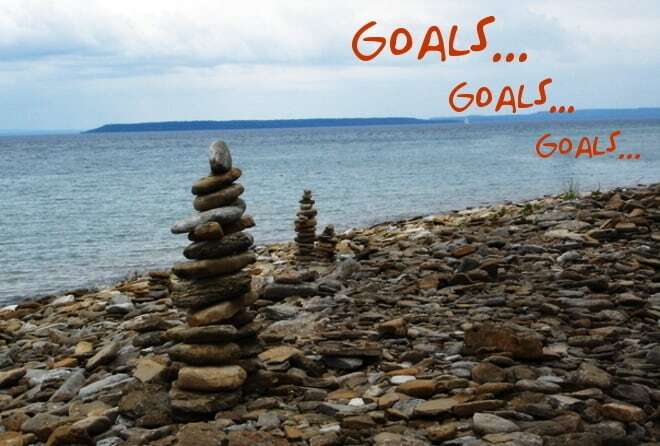 Did you find these goal-setting tips helpful? What resolutions are you making for the upcoming year? I’d love to hear your thoughts! Tagged goal setting, holidays, motivation. Bookmark the permalink. These are some great tips! I’m not sure if I’ll set resolutions this year, but if I do, I’ll follow these recommendations! Glad you found this article helpful, Laura!